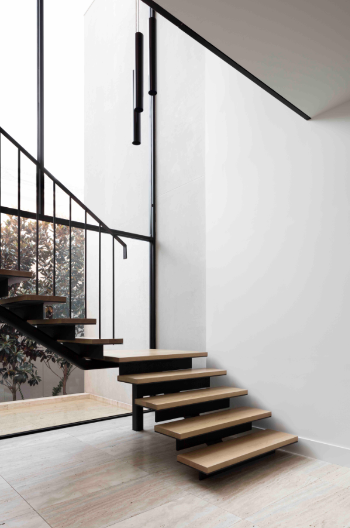 The use of concrete as a feature, has created a distinctly natural aesthetic for an award-winning home in Melbourne's Toorak. Designed by Davidov Partners Architects, the three-bedroom LSD Residence was built to accommodate a couple of soon-to-be empty nesters. The home was conceived as three distinct ground-floor zones containing living, kitchen and dining areas, punctured by two glazed interstitial areas. The upstairs has three bedrooms – each with its own ensuite. The lineal nature of the design was essentially driven by the site itself – a 12 metre frontage narrowing to eight metres. Architect Rob Davidson says the design reflects his preference to use a limited palate of natural materials - something that gives an organic dimension to his finished work. The exterior shell of the building is constructed principally from 390 x 190mm, core-filled concrete blocks. The blockwork has been finished with a 20mm cement render rather than a synthetic render. “On higher-end projects like this, I love the way natural concrete gives me that patina, that liming effect,” Rob says. Rob says he opted for natural grey colouring for the render mix because of its warmth and lightness, enabling it to be used inside and out. 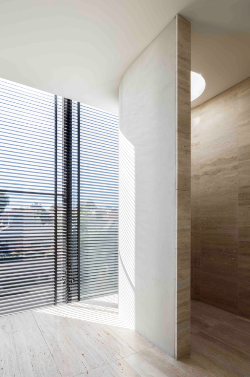 This is demonstrated in the entry foyer, where a section of external walling extends seamlessly into the interior – the continuity clearly visible through the adjoining window façade. The grey concrete finish also complements the platinum and grey-streaked travertine floor tiling used throughout the ground floor, and as exterior paving – again, a material chosen for its natural patina. This relationship between materials used inside and out is also exemplified in the upstairs master bedroom, the defining feature of which is a curving, cement rendered partition wall that envelopes and hides the ensuite. A five-centimetre thick screed on a curving plane was always going to be a challenge for the renderer, but skillful execution has delivered a beautiful, elegant finish that, in itself, makes a strong statement about the ethos of the design and the quality of the forms and finishes. This is something the jury for the 2016 Melbourne Design Awards clearly picked up, awarding the LSD Residence a Silver in the Residential – Constructed category.